Product Description: Puttin on the Mix! Features: Enjoy a season for fashion and style! 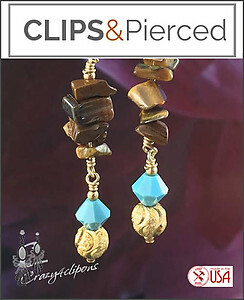 These earrings are a combination of gems (tiger-eye chips), crystal (Caribbean blue Swarovski bicones) and bling (vermeil round beads) all hand wrapped in this pretty earring design.